The Apple iPhone 6s runs on the iOS. It has a 12 MP iSight camera with Focus Pixels and a 5 MP FaceTime HD camera with Retina Flash, which lets you capture crystal-clear images. You can store multimedia files on its 16 GB memory space. Its 4.7-inch Retina HD display, with a resolution of 1334x750 pixels, is apt for watching movies. 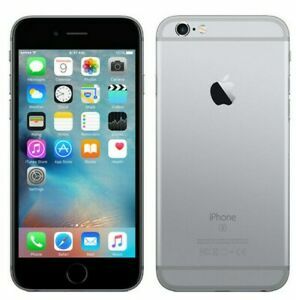 This space gray smartphone is driven by the Apple dual-core A9 processor, which helps you to multitask easily. This device is compatible with Virgin Mobile, Boost Mobile, metroPCS, Xfinity, U.S. Cellular, Straight Talk, T-Mobile, Sprint, Verizon, TracFone Carriers. Great seller, item arrived promptly and as described. Fast shipping. Perfect condition. Would do business again. Came as advertised. Great deal - no issues. Smooth and easy! Highly recommended!! My I phone 5S had a cracked motherboard, and had to be replaced. I-phone 6S was all I needed. Went to the Sprint store and got a new Sim card and was back in business. Had to buy a new Life Proof to protect it, but still fits in my same holder and getting all my apps back from I-cloud was a breeze. No problems at all with this phone. Has the fingerprint ID which is helpful. The phone is in good condition, the back of the phone though has faded spots- a perfect circle around the Apple symbol. The phone also come with a very poor battery, only 74% capacity but I was able to easily replace is for $30 at Best Buy. Other then those two things the phone has been perfect, exactly what I was expecting and Verizon compatible!! Replaced a 5S I've had for over 4 years with this 6S. Didn't think I'd notice much difference but it is a real upgrade. Menus are much snappier, the larger screen is better and the extra frequency bands give me much better LTE speeds. Also like the new shape (thinner and with rounded edges). Still fits well in my pocket even though the screen is larger. Phone looks like it is brand new. Battery is down to 84% capability. Phone was easily activated with my carrier (Tracfone) and works perfectly.